Rho family GTPase regulation of the actin cytoskeleton governs a variety of cell responses. In this report, we have analyzed the role of the GTPase Rho in maintenance of the T lymphocyte actin cytoskeleton. Inactivation of the GTPase Rho in the human T lymphocytic cell line HPB-ALL does not inhibit constitutively high adhesion to the integrin β1 substrate fibronectin. It did however result in the aberrant extension of finger-like dendritic processes on the substrates VCAM-1, Fn, and mAb specific to β1 integrins. Time-lapse video microscopy demonstrated that C3 induced extensions were primarily the result of an altered pseudopod elongation rather than retraction. Once the stellate pseudopodia extended, none retracted, and cells became completely immobile. Filipodial structures were absent and the dendritic-like processes in C3 treated cells were rich in filamentous actin. Immunolocalization of RhoA in untreated HPB-ALL cells spreading on fibronectin demonstrated a diffuse staining pattern within the pseudopodia. In C3 treated cells, clusters of RhoA were pronounced and localized within the altered extensions. GTPase Rho is actively involved in the regulation of T lymphocyte morphology and motility. The T lymphocyte actin cytoskeleton is clearly important in the regulation of cell activity at a variety of different levels. An intact actin cytoskeleton is required for sustained signals leading to T cell activation . T helper and cytolytic effector cells reorient their intracellular components for vectorial secretion of cytokines  or cytolytic components  via cytoskeletal dependent mechanisms. Recent reports suggest an active role played by the T cell cytoskeleton in maintaining spatially defined molecular clusters found within the immunological synapse – a highly structured molecular array defined by contact regions between T cells and antigen presenting cells [4–7], and reviewed in [8, 9] or NK cells and target cells . Although the actin cytoskeleton has been implicated in all these processes, perhaps its greatest role is in regulating T lymphocyte motility and morphology. The first physical step in directional motility is the extension of cellular processes termed pseudopods . Pseudopodia are flattened, fan shape cellular protrusions enriched in signaling molecules and cytoskeletal elements including filamentous actin, which is preferentially nucleated at the leading edge of a migrating cell . A key candidate for regulation of the T lymphocyte actin cytoskeleton is the GTP-binding protein Rho. This small member of the Ras GTPase superfamily has been implicated in fibroblast models of integrin dependent actin stress fiber formation, focal contact assembly , and gene induction via the serum response element . Studies of Rho function have been facilitated by the use of specific toxins such as Clostridium botulinum toxin C3 which catalyses the ADP-ribosylation and inactivation of Rho [15–17]. The function of this GTPase and related family members such as Rac and Cdc42 has been extensively studied in the fibroblast model. In this system it has been shown that Rho function is necessary for the production of actin stress fibers . However, in cells that are considered highly motile and circulate through various compartments of the body (such as T lymphocytes), actin stress fibers have yet to be identified. By comparison to adherent cells such as fibroblasts, less work has been done within the formed elements of the blood, in particular, studies addressing the role played by Rho in the maintenance of T lymphocyte cytoarchitecture. The involvement of Rho GTPases in regulating integrin dependent events such as leukocyte homotypic aggregation and in chemokine upregulation of integrin-mediated adhesion has recently been identified [18, 19]. ADP-ribosylation of Rho in neutrophils by treatment with C3 not only inhibits cellular locomotion, but augments chemoattractant induced actin polymerization [20, 21]. Moreover, inactivation of Rho in monocytic cells leads to accelerated formation of filopodia, and it has been proposed that Rho is a negative regulator of actin polymerization within this cell type . Active Rho is also required for normal morphology, motility, and cytolytic activity of IL-2 activated NK cells [23, 24]. We and others have demonstrated the importance of Rho in T lymphocyte activation [25, 26]. Given the role played by Rho in the regulation of actin microfilaments in other cell types, and the indispensability of a functional actin cytoskeleton in lymphocyte motility and activation, it is of importance to study Rho's role in the regulation of T lymphocyte integrin function and maintenance of cytoskeletal organization. Western blotting analysis confirmed the presence of RhoA (~25 kDa) in the human T cell lines HPB-ALL and CEM (Figure 1A). The bacterial toxin C3 from Clostridium botulinum ribosylates asparagine 41 of the small GTPase Rho [15, 16], resulting in its inactivation. C3 (25 μg/ml) was electroporated into the T cell line HPB-ALL as described in the Materials and Methods. After thorough washing, the cells were incubated for 1 hour at 37°C to allow in vivo ribosylation, then sonicated and lysates subjected to further C3 ribosylation by the addition of 2 μCi [32P]-NAD and 1 μg of C3 in ribosylation buffer. By this method, any further ADP ribosylation of Rho can be identified in vitro after in vivo ribosylation, thus serving as a measure of the efficiency of the electroporation procedure for introducing C3 exoenzyme into HPB-ALL cells . As figure 1B demonstrates, electroporation of C3 transferase (Figure 1B, lane 3) prior to cell disruption prevented further ribosylation of Rho proteins in the cell lysates. The technique of electroporation of C3 was very efficient, as even longer autoradiographic exposures of the gel did not demonstrate incorporation of [32P]-NAD (data not shown). Thus electroporation of the exoenzyme C3 fully ribosylates Rho in vivo, to the extent that no further in vitro ribosylation of Rho can be detected after cell lysis. A. Western blot of RhoA protein in whole cell lysates of the T cell lines HPB-ALL and CEM. B. Electroporation of C3 efficiently ADP-ribosylates Rho in the T cell line HPB-ALL. Cells were untreated, electroporated in the presence of C3 (25 μg/ml), or electroporated in control buffer. After a 1 hr incubation at 37°C, cells were further ADP-ribosylated as described in Experimental Procedures by the addition of exogenous C3 and [32P]-NAD after cell disruption. Inactivation of Rho did not affect the constitutively high adhesion of HPB-ALL cells to the extracellular matrix protein fibronectin (Fn) (Figure 2). When HPB-ALL cells are plated onto β1 integrin substrate such as fibronectin, vascular cell adhesion molecule-1 (VCAM-1), or even antibodies to α4β1 integrins, they respond by extending pseudopodia and displaying a highly flattened, spread morphology (figure 3, panels 4, 7, and 10, and ref ). However, electroporation of C3 appeared to alter HPB-ALL morphology resulting in the extension of very fine branched finger-like cellular processes when cells were plated on the β1 integrin substrates Fn (figure 3, panel 6), VCAM-1 (figure 3, panel 9), or a mAb specific for β1 integrins (figure 3, panel 12). This also occurred for another T cell line, HSB-1 (data not shown), and in activated primary T lymphocytes (Table 1). Untreated HPB-ALL, mock electroporated control HPB-ALL, or C3 treated HPB-ALL do not extend pseudopodia on the non-specific cell attachment substrate poly-L-lysine (figure 3, panels 13–15), demonstrating the requirement for integrin dependent signals in both the normal spreading morphology of HBP-ALL, and the C3 induced morphological changes in this cell type. HPB-ALL adhesion to the extracellular matrix component fibronectin. HPB-ALL cells were either electroporated with C3 (25 μg/ml) or mock electroporated and adhesion to Fn was compared. 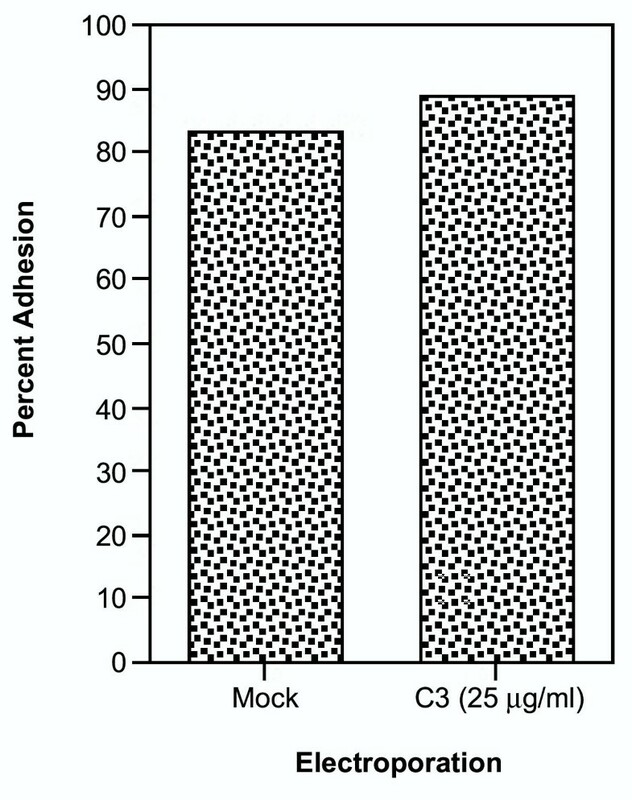 There was no decrease in the adhesion of C3 treated HPB-ALL cells. The standard deviation was less than 10%. ADP-ribosylation of Rho alters HPB-ALL spreading on β1 integrin substrates. Cells were plated on BSA (panels 1–3), Fn (panels 4–6), VCAM-1 (panels 7–9), anti-β1 mAb 33B6 (panels 10–12), or poly-L-lysine (panels 13–15). HPB-ALL cells were electroporated with 25 μg/ml C3 (right column), 25 μg/ml BSA (middle column), or untreated (left column). Initial magnification was 200 ×. Experiments in panels 1–9 and panels 10–15 were performed separately. The images are representative of at least four separate experiments. Morphology of PMA + ionomycin activated primary T lymphocytes. Data represent averages and standard deviation from 3 separate experiments, and are expressed as the percentage of adherent cells demonstrating pseudopodia. All of the pseudopods observed were of the C3 phenotype. Immunolocalization of the GTPase RhoA was performed to determine if inactivation by C3 exoenzyme caused spatial redistribution of RhoA in HPB-ALL. As figure 4 demonstrates, untreated HPB-ALL cells display a diffuse staining pattern of RhoA, with small punctate microclusters throughout the normal pseudopodial extensions (figure 4, left panels, arrows). Staining with secondary antibody alone was negative (data not shown). Inactivation of Rho by electroporation of C3 exoenzyme did not seem to cause a large overall redistribution of RhoA in spread HPB-ALL. However, RhoA appeared to be in relatively larger clusters distributed along the aberrant pseudopodial structures with no diffuse staining observed (figure 4, right panels, arrows). Punctate staining pattern of RhoA in untreated and C3 treated HPB-ALL cells. Cells were stained for RhoA as described in the Material and Methods. Untreated cells are in the left panels, and C3 treated cells are represented in the right panels. Arrows indicate punctate patterns of RhoA in HPB-ALL cells spreading on the extracellular matrix component fibronectin. The Rho family of GTPases is largely responsible for maintenance of cell shape in a variety of cell types, and this involves regulation of the actin cytoskeleton. To localize filamentous actin within HPB-ALL, cells adherent to VCAM-1 were fixed and stained with TRITC-phalloidin. Control electroporated cells display rather diffuse filamentous actin staining in elongated pseudopodial processes that flatten and spread out on their termini, and there are multiple filopodia extending from these processes and from the cell body (figure 5A, arrows). Cells that had been treated with C3 exoenzyme however all contain highly enriched filamentous actin within the extended pseudopods. This is true on the substrates FN and anti-β1 integrin mAb (data not shown). 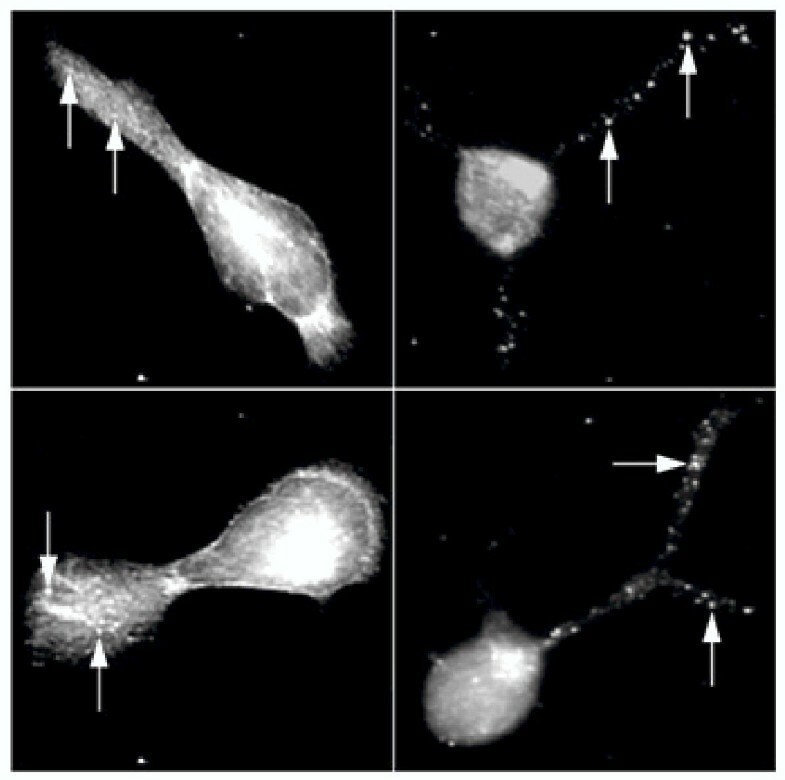 In the C3 electroporated cells, small filopodia extending from the cell body are absent, and multiple branched pseudopodial structures are largely enriched in filamentous actin (Figure 5B, arrows). Of interest, electroporation of C3 in conjunction with FITC-labeled monomers of actin did not demonstrate incorporation of FITC-actin in the altered pseudopods at early time points (data not shown), suggesting that the filamentous actin in the altered pseudopods initially results from rearrangement of pre-formed actin filaments. TRITC-phalloidin staining demonstrates that altered pseudopodia are enriched for filamentous actin. 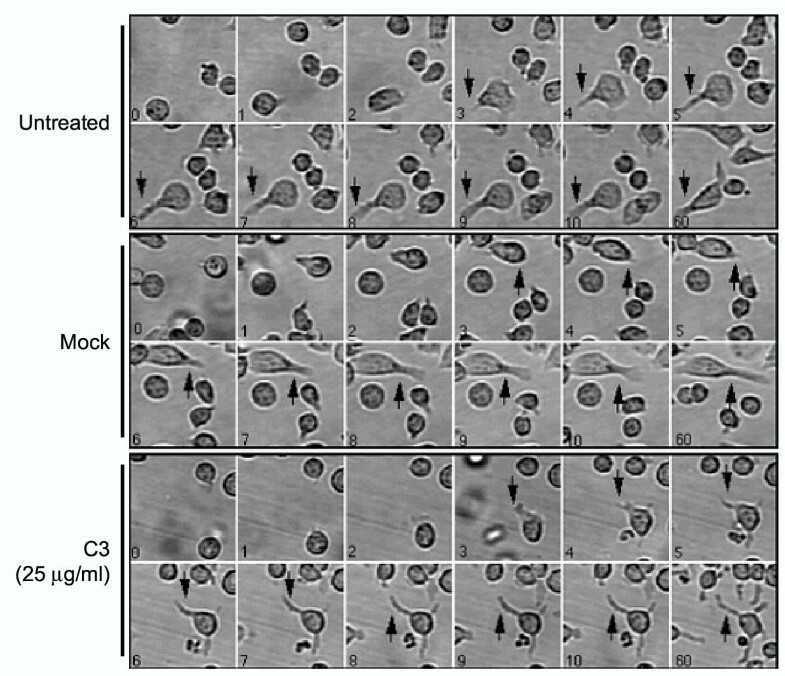 Cells were electroporated with control buffer (A), or electroporated with C3 (25 μg/ml, B, C) and plated on VCAM-1 that had been immobilized on glass coverslips. In fibroblast models, inactivation of Rho causes retraction of pre-formed pseudopods with a resultant deposition of parallel tracks of thin dendritic processes , a phenotype ultimately resembling that seen in C3 treated HPB-ALL. The phenotype induced by C3 mediated ribosylation of Rho in HPB-ALL could result from either aberrant retraction of recently formed pseudopods, or altered pseudopodial extension. These possibilities were explored using video time-lapse microscopy. Figure 6 demonstrates HPB-ALL spreading on VCAM-1 over a period of 1 hour, where images from the first 10 minutes were obtained from recorded videotape, followed by a 60 minute time point. Untreated cells and mock electroporated cells demonstrate normal HPB-ALL cell spreading (figure 6, see arrows). They extend thick pseudopodia with fanned termini, and their cell bodies are flattened and oval in shape. The C3 induced phenotype forms at the onset of cell spreading (figure 6, see arrows). The finger-like extensions initially form from a rounded cell body and elongate throughout the duration of the assay. 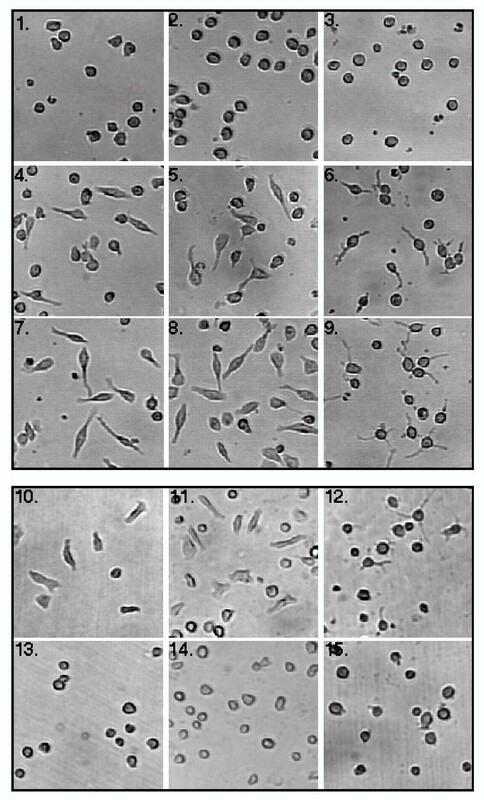 The stellate projections are clearly delineated even at their termini, and the cell bodies do not demonstrate a flattened, oval, or spindle phenotype. Thus, the C3 induced stellate phenotype is not primarily due to aberrant pseudopodial retraction, but an altered pseudopodial extension. Also of note was the effect of C3 on the dynamic maintenance of pseudopodia. Under normal or control electroporation conditions, some of the VCAM-1 adherent cells would retract pseudopodia, then form new extensions in different directions. This activity was clearly inhibited in the C3 treated cells. Once the aberrant finger-like projections were formed, no pseudopodial retraction was noted during this time period, and the cells became completely immobile. Quantification of the original movies indicate that only 1.7% (1/60) of the C3-treated cells were motile whereas 34.9% (45/129) of mock-electroporated cells displayed motility. See additional file1:C3.mov and file2:mock.mov for the original movies. Video time lapse microscopy demonstrates that the morphologically distinct HPB-ALL pseudopodia are due to aberrant extension, rather than aberrant pseudopodial retraction. 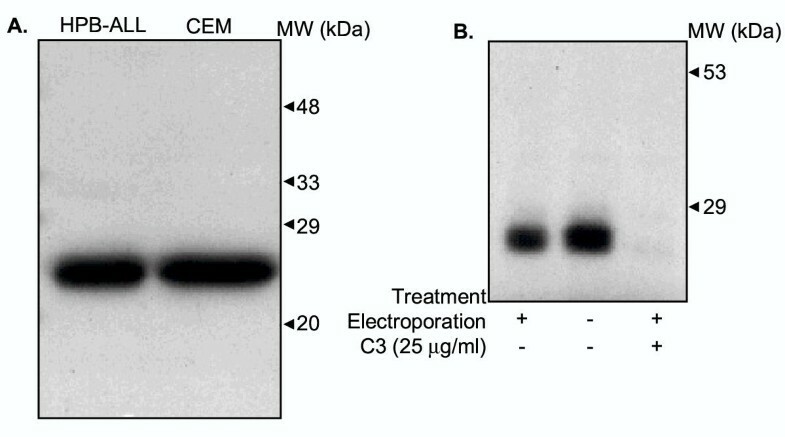 Cells were "untreated," subjected to electroporation in control buffer ("mock electroporated"), or electroporated in the presence of C3 (25 μg/ml, "C3 electroporated"). Cells were then plated onto VCAM-1 and let spread for 1 hr (as described in Materials and Methods) while being recorded by a CCD camera and time lapse VCR. Numbers in lower left corners of images denote time elapsed in minutes. Arrowheads identify pseudopodia of spreading cells. Initial magnification was 400×. In the present study, we demonstrate that ADP-ribosylation of the GTPase Rho in HPB-ALL cells does not result in a decrease in constitutively high adhesion to the extracellular matrix component fibronectin. However, inactivation of Rho protein does result in the aberrant extension of finger-like, branched dendritic projections in HBP-ALL cells when plated on the substrates VCAM-1, fibronectin, and mAb specific for β1 integrins. Altered pseudopodial extension required β1 integrin signaling, as C3 treated cells plated on the non-specific cell attachment factor poly-L-lysine did not extend dendritic like processes. Electroporation of polyclonal antibodies specific for RhoA mimicked the C3 induced phenotype (data not shown). The C3 induced extensions were rich in filamentous actin, and C3 treated HPB-ALL cell bodies apparently lacked filopodial actin microspikes, present in normal spreading cells. Immunolocalization studies of RhoA in C3 treated HBP-ALL cells spreading on fibronectin showed no gross differences in RhoA distribution, however clusters of RhoA were more delineated along the finger-like dendritic processes of the C3 treated cells. Thus, functional Rho is required for the proper extension and retraction of pseudopods in T lymphocytes on β1 integrin substrates. A large body of work has described the morphological functions regulated by small GTPases of the Rho subfamily. Members of this family include RhoA, RhoB, RhoC (which are isoforms), Cdc42, G25K, RhoG, Rac1, Rac2, and TC10 (reviewed in ). In fibroblast models, these GTPases have been proposed to act in a concerted hierarchy to coordinately regulate distinct morphological features. Filopodia formation of short filamentous actin microspikes gives way to membrane ruffling and lamellipodia formation, culminating in the organized production of actin stress fibers. This has lead to the hypothesis that small GTP binding proteins act sequentially, in the GTPase cascade Cdc42→Rac→Rho . Facilitating the study of Rho in regulation of cell activity has been the use of C3 exoenzyme, a toxin from Clostridium botulinum that ADP-ribosylates [15, 16] and inactivates Rho proteins. Although ribosylation of other Rho family proteins such as Rac1 can occur with C3 , this seemed to be very weak . In our work, C3 electroporated into the T cell line HPB-ALL caused complete ADP-ribosylation of Rho proteins (~25 kDa). Although Rac1 and Cdc42 were identified in western blots of whole cell lysates prepared from the T cell lines HPB-ALL, CEM, HSB (data not shown), and PB human T lymphocytes (data not shown), there was no detection of ribosylation in the lower molecular weight Rac and Cdc42 related GTPases in HPB-ALL cells, indicating the specificity of C3. Previous reports have demonstrated that ADP-ribosylation of B-lymphoid cell lines by C3 treatment inhibits phorbol ester induced cellular homotypic aggregation . Also, phorbol ester and chemoattractant (IL-8 and fMLP) induced pre-B lymphoblastoid adhesion to VCAM-1 and neutrophil adhesion to fibrinogen was abrogated in a dose-dependent manner by C3 exoenzyme . This may indicate that in cells of hematopoietic lineages, the induction of an increased adhesive state may be susceptible to regulation by Rho proteins. However, we have recently demonstrated that induced adhesion of primary T lymphocytes to fibronectin is unaffected by Rho inactivation , and data presented here suggests that constitutively high adhesion of HPB-ALL cells to β1 integrin substrate is unaffected by C3 treatment. Others have demonstrated that inactivation of Rho in monocytes promotes cellular adhesion to β1 integrin substrates . Static cell adhesion studies rely on a number of factors including integrin affinity regulation, integrin avidity/clustering, and shear resistant cell shape changes. Factors affecting adhesion can do so by regulating any number of these parameters. Thus the effects due to Rho inactivation on cell adhesion may not only influence one or more of these parameters, but also be cell type specific even amongst the cells of the hematopoeitic lineage. The phenotype induced by ADP-ribosylation of Rho in T lymphocytes appeared different than that induced in fibroblast models, where microinjection of C3 results in fibroblast retraction of pseudopodia, with the cell body rounding up eventually to become non-adherent . Video time-lapse microscopy demonstrated the elongation of aberrant pseudopods in HPB-ALL cells plated on the β1 substrate VCAM-1, rather than an altered retraction of already formed pseudopods. These results suggest an altered pseudopodial extension although a defect in contractibility could be involved as a secondary mechanism for formation of aberrant processes. This phenotype also coincided with the complete loss of cellular motility in HPB-ALL, even though adhesion to substrate was not noticeably altered. It is also important to note that normal and C3 induced aberrant HPB-ALL spreading on Fn or VCAM-1 is dependent on signals generated through β1 integrins, as both morphologies could be seen when untreated or C3 treated HPB-ALL were plated on the β1 specific mAb 33B6. When these same cells are plated on the non-specific cell attachment factor poly-L-lysine, cells remain round and no spreading occurs. The elongated dendritic-like processes in C3 treated HPB-ALL cells were F-actin rich. This phenotype caused by inactivation of Rho is the first to be described in T lymphocytes, however, Rho regulation of the actin cytoskeleton is not novel among cells of the hematopoietic lineage. ADP-ribosylation of Rho proteins in chemoattractant stimulated neutrophils [20, 21] and in both monocytic lines and fresh blood monocytes [22, 38] results in actin filament polymerization. Although this once again highlights differences between the affects of C3 in fibroblasts and leukocytes, there may be commonalties amongst cells that do not form distinct actin stress fibers, such as leukocytes and neuronal cells. ADP-ribosylation of Rho proteins by C3 exoenzyme prevents neurite retraction in the specialized growth cone of developing neurons, and in fact promotes neurite outgrowth in the same fashion as microinjection of purified dominant negative RhoAT19N . In these instances, neuronal N1E-115 cell outgrowth induced by inactivation of RhoA was mimicked by microinjection of Rac1- or Cdc42-GST fusion proteins, and could be abolished by coinjection of dominant negative Cdc42T17N or Rac1T17N . From these results, the authors concluded that inactivation of RhoA by C3 exoenzyme treatment resulted in the activation of Rac1 and Cdc42 GTPases, suggesting the mutually exclusive function of RhoA and Rac1/Cdc42. Cdc42 has been implicated in the formation of small, actin-rich filopodia , which are similar to those seen on spread HPB-ALL cells (figure 5) around the periphery of the cell body and extended pseudopods. After C3 electroporation, HPB-ALL were allowed to spread on VCAM-1 for 1 hour, and TRITC-phalloidin staining demonstrated the complete absence of fine filopodial structures. Given the morphologic similarity between neurite outgrowth of N1E-115 cells and the aberrant pseudopodial extension of HPB-ALL when RhoA is inhibited with C3 exoenzyme, it will be interesting to determine if other GTPases such as Rac or Cdc42 are activated to promote this phenotype after C3 treatment of HPB-ALL cells. The thick actin rich stellate projections emanating from the cell body of C3 electroporated HPB-ALL may be the result of condensation of filopodia, where Cdc42 may be induced into a highly active state. Actin filament elongation would continue and RhoA dependent retraction of filamentous actin would be abrogated. This could occur by the release of limited effector molecules shared between the two GTPases, possibilities that are currently under investigation. The immunolocalization of RhoA in normal and C3 treated cells did not appear drastically different in that RhoA was apparent in both normal and aberrant pseudopodial extensions. The notable exception was that clusters of RhoA appeared less diffuse in the altered pseudopods of C3 treated cells (figure 6). Although ADP-ribosylation of Rho does not significantly alter the subcellular distribution of RhoA, Rho activity is inhibited. This is thought to prevent activation of downstream Rho targets required for normal integrin dependent morphological changes. A number of potential downstream Rho effector molecules have been identified recently. These include p150 RhoA-binding kinase α and β (p150 ROKα and β) [40, 41], p160 Rho-associated coiled-coil containing protein kinase (Rho-p160ROCK) , p164 Rho kinase , p120 protein kinase N (p120 PKN) [44, 45], and PKC-related kinase-2 (PRK-2) . These kinases specifically bind to the GTP bound form of Rho, except for PRK-2, which can bind both Rho and Rac GTPases. Interestingly, inhibition of Rho-p160ROCK has recently been shown to give similar lymphocyte morphology as inhibition of Rho with C3 . Another interesting candidate may be p120 PKN, as recent studies have established that PKN phosphorylates cytoskeletal intermediate filaments  and is directly linked to the cytoskeletal network through associations with α-actinin . Also, PKN may be involved in relating cytoplasmic signals to the nucleus, for in response to stress, nuclear translocation of PKN occurs . This is particularly important in light of previous work demonstrating that inactivation of Rho in peripheral blood T lymphocytes inhibits costimulatory signals up-regulating IL-2 production . Future experiments will focus on determining the relationship of Rho GTPases and the regulation of T cell morphology [25, 51, 52]. Inactivation of Rho results in an active elongation of actin rich, finger-like dendritic processes dependent on β1 integrin signaling. Thus Rho activity is required for T lymphocyte spreading morphologies, and is required for T lymphocyte motility. In static cell adhesion assays, however, Rho activity is not required to maintain constitutively high levels of adhesion to fibronectin. Further study of Rho and it's related GTPases and downstream effector molecules, will be important in elucidating mechanisms regulating the lymphocyte cytoskeleton and thus T cell function. Poly-L-lysine was purchased from Sigma Chemical Co. (St. Louis, MO). Fn was affinity purified from 200 ml of human plasma (Gulf Coast Regional Blood Center, Houston, TX). Briefly, gelatin-conjugated sepharose bead columns were pre-washed with PBS containing 2 mM EDTA and 0.1 mM PMSF. After washing, plasma containing 2 mM EDTA and 0.1 mM PMSF was passed over the column twice, then washed with at least 4 volumes of PBS/EDTA/PMSF. Elution of FN from the columns was performed with 4 M urea in 0.15 M NaCl, 2 mM EDTA, 0.1 mM PMSF, 20 mM Tris-HCl, pH 8.0. Collected fractions were dialyzed in PBS. All procedures were carried out at RT. Fn purity was determined by SDS-PAGE. VCAM-1 was provided by Dr. S. Fong (Genentech, San Francisco, CA). C3 exoenzyme was purified as previously described . Anti-β1 integrin mAb 33B6 and anti α4β1 integrin mAb 19H8 were generated in this laboratory and have been previously described [27, 28]. Rabbit polyclonal anti-Cdc42, -Rac1, -Rac2, -RhoA, and mouse monoclonal anti-Ras, were purchased from Santa Cruz Biotechnology (Santa Cruz, CA). The T cell lines HPB-ALL and CEM were maintained in complete media (RPMI-1640 supplemented with 10% FBS; 10 U/ml of both penicillin and streptomycin; and 1 mM L-Glutamine, all from Life Technologies, Grand Island, NY). Freshly isolated peripheral blood T cells were purified and activated by cross-linking CD28 and CD3 as previously described . HPB-ALL cells were plated on VCAM-1 in the temperature controlled environment of an inverted Nikon (Melville, NY) Diaphot-TMD microscope for 1 hour. During this time, images were obtained through an Optronics (Galeto, CA) VI-470 CCD camera and recorded by time-lapse cinematography on a Panasonic (Secaucus, NJ) sVHS AG-6730 time-lapse videocassette recorder. Recordings were played back and digitized on a Macintosh IIVX computer equipped with a Data Translation (Marlboro, MA) Frame Grabber card using NIH IMAGE software (available from ftp://codon.nih.gov/pub/nih-image/nih-image161_fat.hqx). For fluorescence microscopy, glass coverslips were coated with Fn (10 μg/ml), VCAM-1 (5 μg/ml) or mAb 19H8 (0.5 μg/ml) for at least 2 hours at 37°C in 50 mM Tris (pH 9.5). Coverslips were blocked with BSA (1% w/v in PBS) for 30 min at room temperature then washed with PBS. HPB-ALL cells were then plated onto the coverslips and incubated for 1 hour at 37°C in complete media. The cells were then washed on the coverslips, and fixed with 2% paraformaldehyde for at least 30 min at 4°C. A solution of 0.1% TritonX-100 was then used to permeabilize the cells by treatment for 10 min at 4°C. After permeabilization, coverslips were again blocked with 1% BSA. After washing in PBS, 80 μM phalloidin-TRITC or 1 μg/ml anti-RhoA antibody was incubated for 30 min at 4°C. Cells were visualized on a Nikon DIAPHOT-TMD inverted microscope and images were digitized as described above. All western blotting steps were carried out at 4°C for at least 2 hours. Cell lysates from approximately 2 × 106 cell equivalents were subjected to 12.5% SDS-PAGE, transferred onto PVDF membranes (Bio-rad, Richmond, CA), then blocked with 5% BSA and 5% non-fat milk. Membranes were extensively washed, then incubated with the primary (0.5 μg/ml) polyclonal anti-RhoA. After washing, membranes were incubated with Goat anti-rabbit polyclonal antibody conjugated to HRP (Cappel, Durham, NC). Chemiluminescence was performed as described by the manufacturer (Pierce, Rockford, IL). Adhesion assays were performed in modified Tyrodes buffer  composed of 12 mM NaHCO3 (pH 7.4), 150 mM NaCl, 2.5 mM KCl, 2 mM MgCl2, 1 mg/ml BSA, and 1 mg/ml glucose. Plates were pre-coated with Fn (10 μg/ml) for at least 2 hours at RT in 0.1 M NaHCO3. BSA (2% w/v) was then added to block unbound sites. Cells were resuspended in modified Tyrodes buffer. After the cells were added to the washed plates in 100 μl of modified tyrodes (1 × 105 cells), plates were spun at 300 rpm for 5 min, then incubated for 45 min at 37°C and 5% CO2. Two images were digitized (see above) from each well before washing, then plates were carefully washed 4 × with pre-warmed (37°C) modified Tyrodes buffer. After washing, images from the same position were digitized. Cell numbers were quantitated using NIH Image software, and adhesion assays are graphed as the percentage of input cells remaining after washing. HPB-ALL cells were washed in RPMI-1640 and resuspended between 1–2 × 106 cells per 100 μl RPMI-1640. Control cells were electroporated with the indicated control buffers. Cell samples were placed into pre-chilled (4°C) 4 mm or 1 mm electroporation cuvettes (BTX Inc., San Diego, CA) and electroporated under the following conditions: 500 V/capacitance and resistance, 1250 μF capacitance timing, 720 ohms resistance, and 270 V for 4 mm gap cuvettes or 68 V for 1 mm gap cuvettes (field strength of ~700 Vcm-1). Both antibodies and C3 were electroporated at a final concentration of 25 μg/ml, incubated on ice for 5 min, then washed with complete media at room temperature and used for assays. Control buffer for electroporation of C3 consisted of the buffers used in the purification of C3, including the appropriate concentration of bovine α-thrombin . All electroporation of proteins were carried out on an Electro Cell Manipulator 600 (BTX Inc.). This procedure had previously been optimized for intracellular incorporation of macromolecules by electroporation of goat anti-mouse FITC conjugated antibodies. Electroporation efficiency during the optimization procedure was monitored by FACS analysis and fluorescence imaging (data not shown). Purified C3 or BSA control were electroporated at a concentration of 25 μg/ml. After electroporation, cells were transferred into 1.5 ml eppendorf tubes and incubated for 1 hr at 37°C to allow ribosylation. Cells were then washed extensively in 1% BSA/PBS to remove any C3 not incorporated into the cells. Next, the cells were resuspended at 3 × 106 cells/ml in ice cold sonication buffer (250 mM sucrose; 10 mM HEPES, pH 7.4; 1 mM EDTA; 5 mM MgCl2; 1 mM DTT; 0.1 mM GTP; 1 μg/ml leupeptin, 1 μg/ml pepstatin A, and 1 μg/ml aprotinin; 1 mM PMSF) and sonicated for 10 seconds. After sonication with a Sonic Dismembrator Model 300 with microtip (Fisher), 100 μl of the mixture was added to 50 μl of 3 × reaction buffer containing 150 mM Tris-HCl, pH 8.0; 30 mM thymidine; 3 mM DTT; 5 mM MgCl2, 0.3 mM GTP. To this mixture, 1.0 μg purified C3 and 2 μCi [32P]-NAD (NEN-Dupont, Boston, MA) were added. After incubation for 1 hr at 37°C, SDS was added to 2% final w/v and this mixture was immersed in a boiling water bath for 10 min. Eight volumes of ice cold ethanol was then added, and these samples were kept at -20°C for at least 1 hr. Precipitated proteins were pelleted, and dissolved in SDS-PAGE sample buffer by boiling for 10 min. Samples were then subjected to 12.5% SDS-PAGE and analyzed by autoradiography. We would like to thank J.N. Wygant for technical assistance. This work was supported by grant CA62596 from the NIH and NAG 2–1505 from NASA. DGW drafted the manuscript, performed ADP-ribosylation experiments, adhesion and spreading assays, and immunofluorescence. DKW and TU expressed and purified C3 exoenzyme. TKT performed initial spreading experiments and video time lapse microscopy. YM performed experiments on activated human T cells. EGC helped generate the methods to electroporate suspension cells with C3 exotoxin. BFA quantitated the time-resolved morphological alterations. BWM aided in the conception, design, and implementation of the experiments, and edited the manuscript.